Some smart folks hacked my dear old website recently. Hopefully it's now all repaired and back to full working order but feel free to reprt any problems that you might come across. Basically I am an entertainer and a record player artist. I build machines that play music, especially 7'' vinyl. 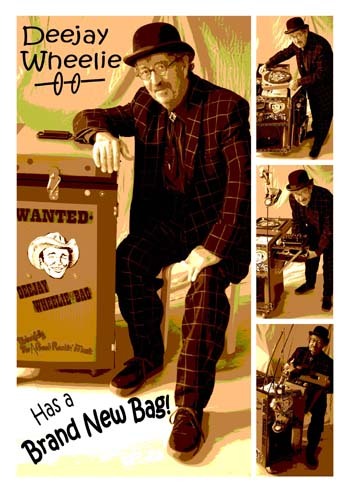 I perform with my own machine (known as a Wheelie Bag Sound System). I design and make a variety of games, cards and novelties for my shows and for sale in the website site shop. Have a look around and don't be afraid to get in touch. PS But I'd rather you did'nt hack. You can also check http://theselby.com/galleries/deejay-wheelie-bag/ for more stuff about who and what I am. I have been playing music from my eclectic mix of original 7 inch vinyl for some 30 years, mainly around London clubs and bars. I currently have two regular shows a month. See the gig page for dates and locations. The shows are a bit of a mix between music and cabaret. I invite audience participation and include somewhat surreal games with even stranger prizes - all from the Dalston Pound Shop. The video clip shows one such game playing out at one of my regular bars The Old Fountain at Old St. EC1. The game is a version of Bags of Character. I developed Bags of Character as a role play game based on wearing miniature fancy dress outfits tied on with string. It has great illustrations by Vince Ray and is ideal for what I would call an 'after dinner' party game. You can buy various versions of the game at the shop. You can also email me if you want a particular theme and I'll make you up one to suit your event. Also included in my Shows are two electric dancing girls, Surfer Sue and Venus De Vinyl, known as the Wheelettes. You can hear them introduce the Show if you visit the podcast. This is a brand new idea! I am now building what you could call suitcase radio stations. I want to bring back the excitement of live performance radio, the physicality of it all. Radio sets, transmitters, djs scurrying around with homemade broadcasting equipment, audiences desperately tuneing into a dodgey signal. 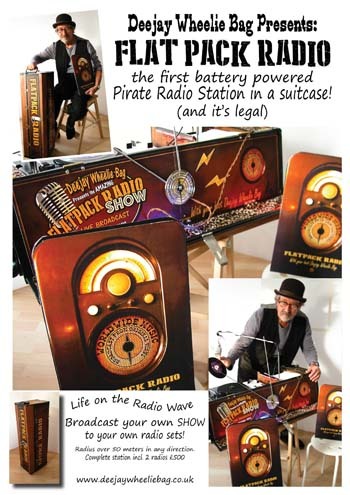 The conventional pirate radio uses a 40 watt radio transmitter. It is illegal because the band frequencies are strictly controlled by licensing. There are however some broadcasting bands that do not require a license. The recent development of wire free devices from keyboards to routers and in particular wifi audio speakers provides a great opportunity to resuscitate the Audio Star. Inside a Wheelie Bag suitcase radio station is a media playing device, a mixer, a mic, a number of receivers for distribution around the venue and a wifi transmitter. It may be under the radar but there is no need to go under the bed clothes to listen to it - it’s legal! It uses low volume, audience based receivers rather than stage based amplification - more suited to a high street coffee shop than a late night dance club. As well as an opportunity to play music it is well suited for the spoken word.